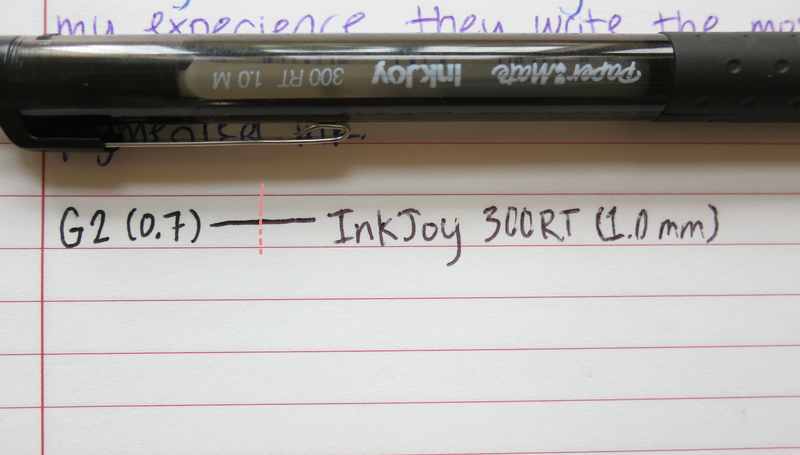 The InkJoy line comes in a variety of styles: the 100ST, 100RT, of course the 300RT, 550RT, 700RT, Ballpoint Quatro multi pen, mini ST and RT, Stylus 2 in 1, and the InkJoy Gel Pen. Click here to go to the PaperMate InkJoy website to learn about all of these pens. All of these are ballpoint pens except for the Gel Pen, obviously. "ST" stands for stick, and all of the ST pens are capped. On the other hand, RT stands for "retractable." so all of these pens are - you guessed it! - retractable. As you go up the numbers in the line, I think the only big difference is the body of the pen. 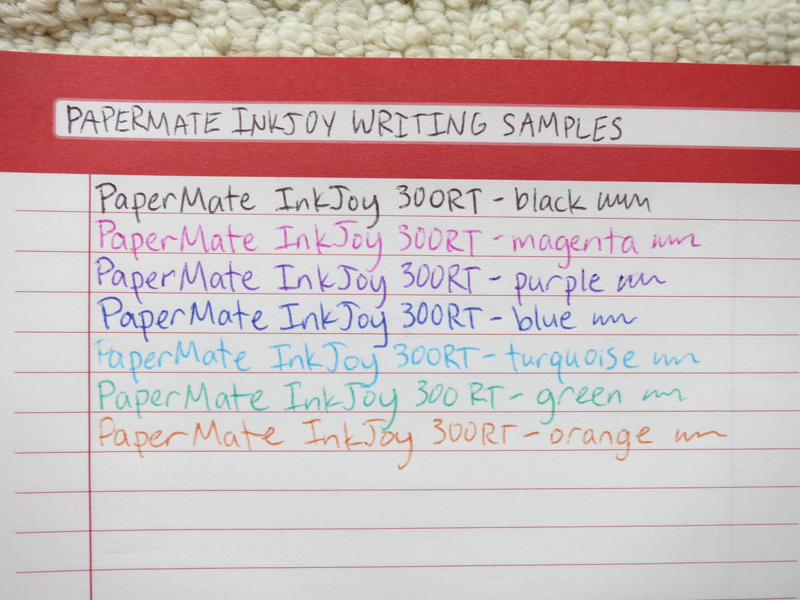 The Paper Mate InkJoy 300RT comes in 10 different colors: red, orange, normal Kelly green, lime green, dark blue, turquoise (light blue), magenta (pink), purple, mocha (brown), and black. I got an 8-pack that includes all of the colors except for light green and brown, though I have since then lost the red one. They come with either a 0.7 mm tip or a 1.0 mm tip, though mine are in the latter. As far as I know, 1.0 mm is available in all colors, but 0.7 mm is only available in the common "office" ones (e.g. blue). Since it was so long ago, I don't remember how much it cost. However, it was probably something pretty reasonable because you can buy the same 8-pack I have off of Amazon for $2.99. Target's online store has it priced at $3.82. When it comes to availability, these pens are pretty easy to find. 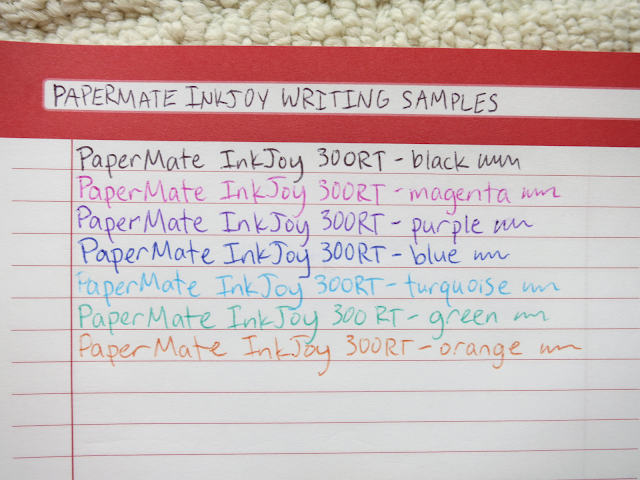 Though a pack of the InkJoy 300RT with brown and light green is very difficult to find online (well, everywhere actually), from the Internet you can easily buy the rest of the colors in 1.0 mm, which is considered a medium tip. As for in-store, I've seen these pens a lot. You should be able find them in Walmart, Target, Office Depot, or any other similar place. I personally got mine from Meijer. As mentioned before, these are retractable pens, which is something I like. When it comes to ballpoint and rollerball pens meant for everyday writing, I kind of hate capped ones; it can not only be incredibly inconvenient if your cap rolls away, but they also seem cheap to me. The clicker of the 300RT is a little stiff, more rigid than a Pilot G2, but it's not so rigid that it's a big deal (and I know that some people like tighter clickers). The pen body is round and made of semi-transparent plastic. Without the tip out, it's 5 3/8" long. 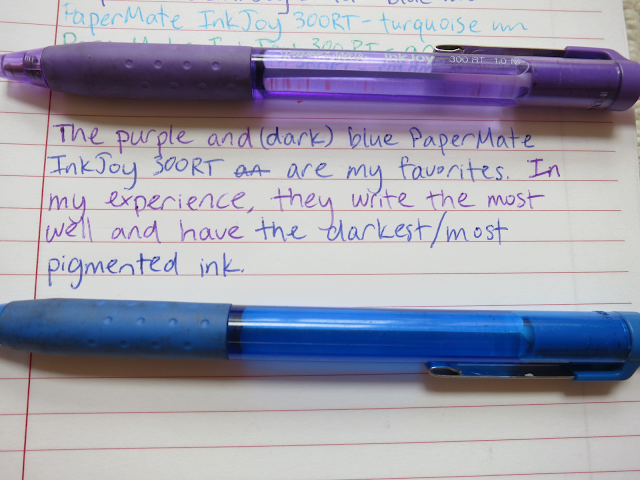 All of the body, including the rubberized grip, matches the pen's corresponding ink color. Like most rubber grips, they will get dirty easily. Last school year, I carried the dark blue and purple pens with me in my pencil case. There were also pencils and a pencil sharpener in there, so graphite got all over the grips. What you see here is after I erased as much as I could. The logo and name of the pen is printed on the body in white, and it's small enough to not be distracting. The clip is made of metal, which is something I haven't seen before, so it won't be easily broken (unless you seriously manhandle the plastic part that the metal is attached to). Though the body is translucent, it's still not transparent enough to see the cartridge inside. If you want to see how much ink you have left, you would have to take the pen apart. Speaking of taking the pen apart, this is very easy to do; the pen unscrews right above the grip. Though it's nice that this doesn't take much effort, it also means that it can unscrew by itself. As I said earlier, I kept the dark blue and purple pens in my pencil case, and my everyday movement caused them to come apart in the bag. This is annoying, though it shouldn't be a problem if you keep your pens in a loop or in a space where they can't move around much. In my opinion, the body of the 300RT is not comfortable nor uncomfortable. 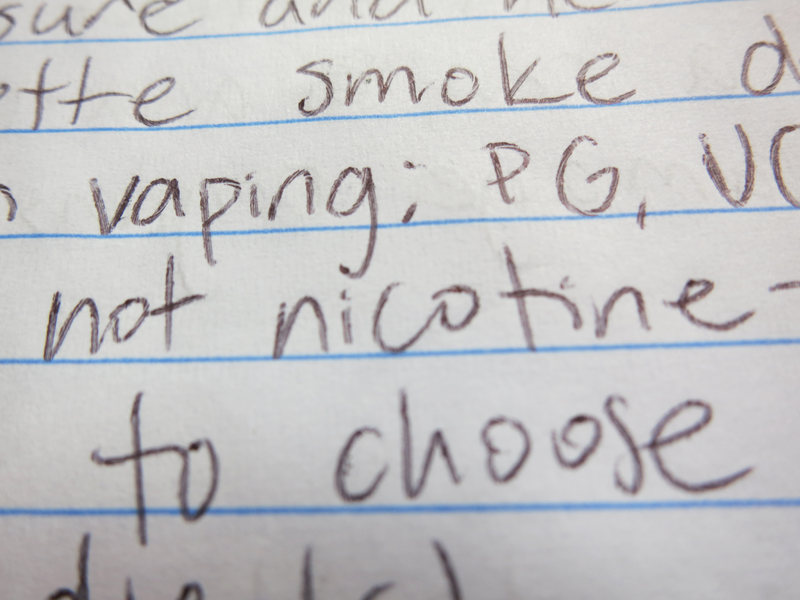 When writing for long periods of time, I have the same amount of discomfort as I do with most other pens. However, I would like to note that you don't need to press down very hard to get an acceptable line. The ink itself is okay; some of the pens fare better than others. 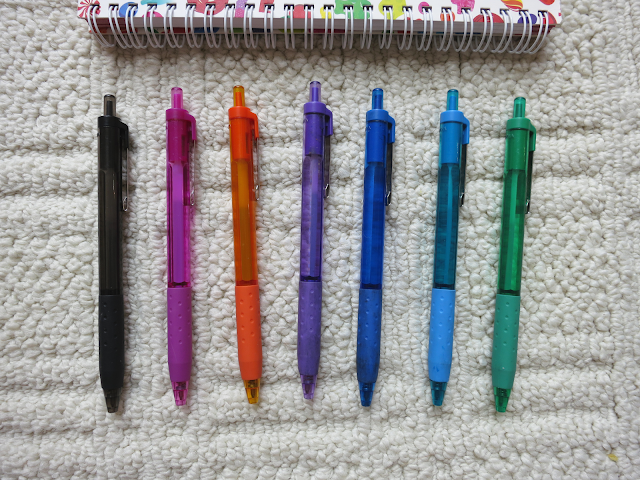 When you first start writing with them, or if you haven't used the pen in a while, the pen might either A: flat out not work for a stroke or two, or B: constantly skip/railroad. Generally though, it will start behaving soon after. With a couple of them (most notably the orange and turquoise), ink wouldn't be laid down for the first stroke or letter of the day, but then there would be no other problems after this initial line. I had the most problems with the green and black (though the black was behaving well in the first writing sample). Neither of the two is very dark/pigmented because they would constantly railroad* when I used them. Sometimes, I had to write pages of text before they started becoming more consistent, and the black still often doesn't work well in the later writing sessions of the day. My favorite colors are the dark blue and purple. The ink of these two pens is the most reliable, consistent, and pigmented (well, pigmented for a ballpoint) out of all the colors I have. The magenta is also quite nice. The ball of this pen is 1.0 mm, though the line it creates is a lot thinner than that (probably just due to the nature of ballpoint ink). 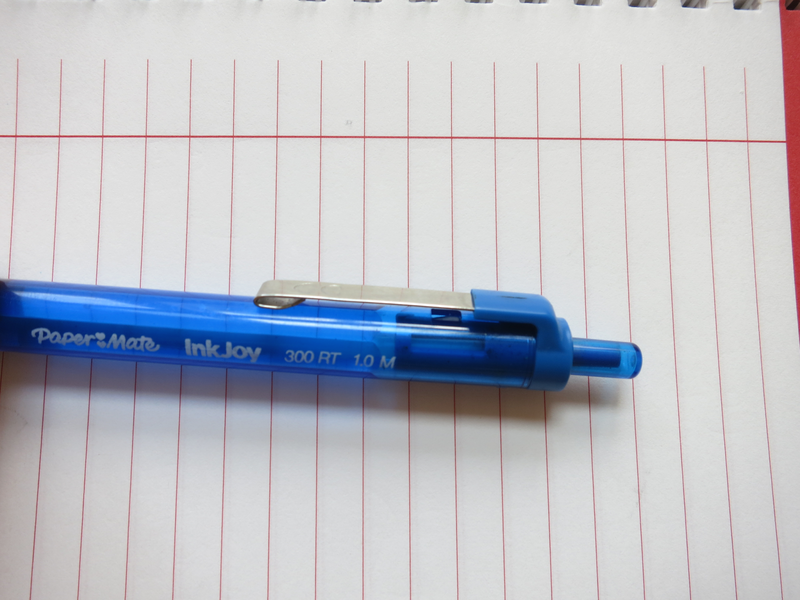 It's pretty comparable to line width of a Pilot G2 (a gel pen) in 0.7 size. Thus, this truly is a "medium" pen. 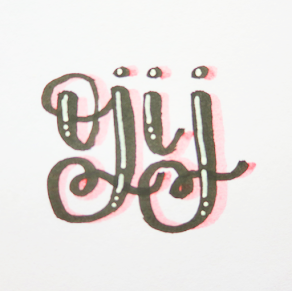 I also did some tests on the ink. 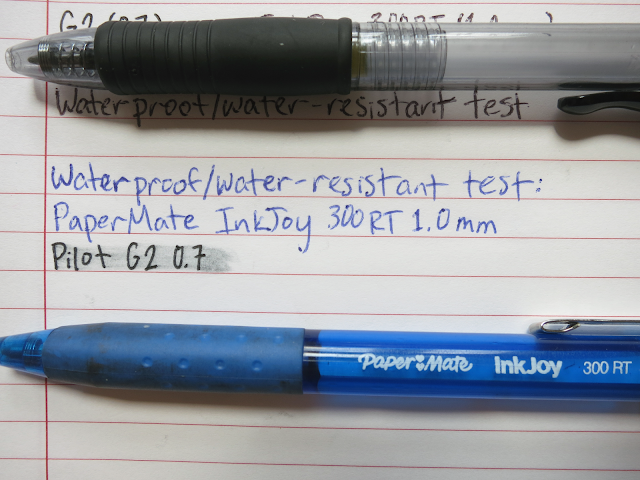 For this waterproof/water-resistance test, I waited until the ink was dry, then I swept a slightly wet paper towel across the words. Through bitter experience, I knew that the Pilot G2 is not water-resistant, so that wasn't too shocking, but the result of the 300RT was a nice surprise. It's not 100% waterproof, but it's definitely water-resistant; it only smears a tiny bit. This second test is a smear test. I used the pen then ran my finger across it immediately after I finished writing, after 3 seconds, after 5 seconds, and after 10 seconds. 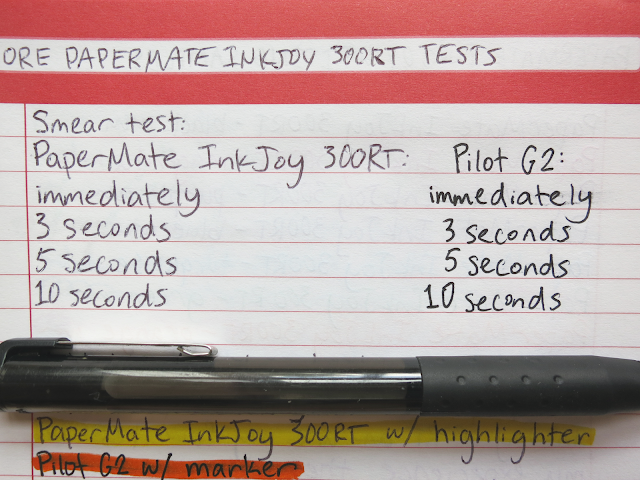 Because the ink of the InkJoy 300RT dries fairly quickly, this test was pretty much only done for a better comparison against the G2. 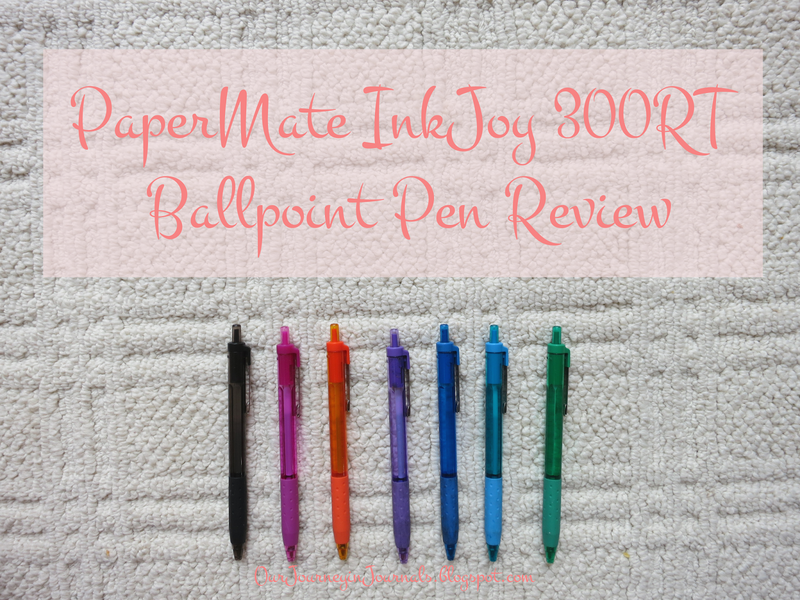 Overall, I would give the PaperMate InkJoy 300RT pens a 7/10 stars. 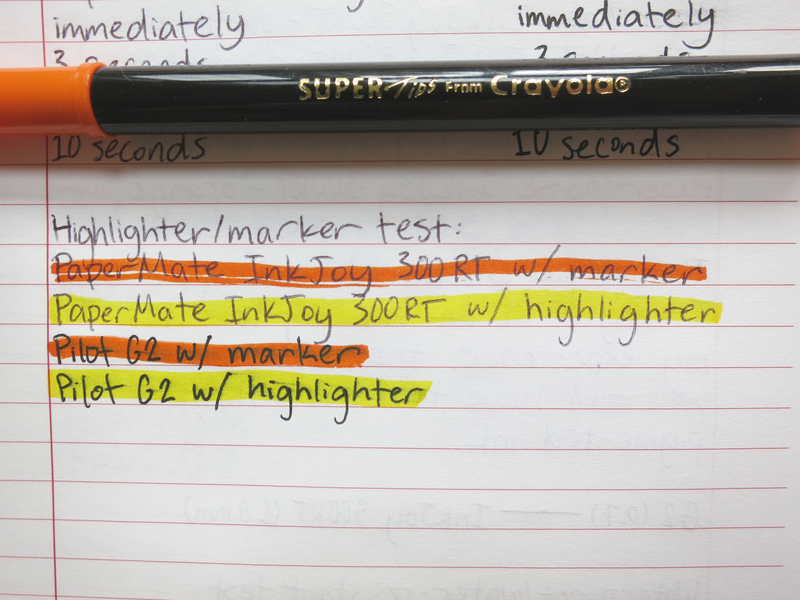 It has some nice features, such as the water-resistant, quick drying, and non-smearing ink, the price, the availability, and the 10 different colors. 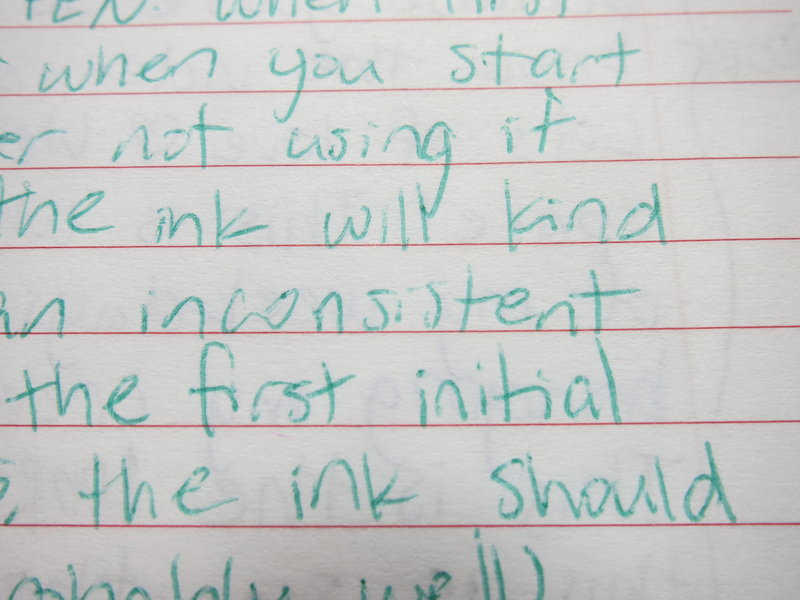 However, the inconsistency of the ink is annoying enough that I would not be able to use these pens as a daily writer. 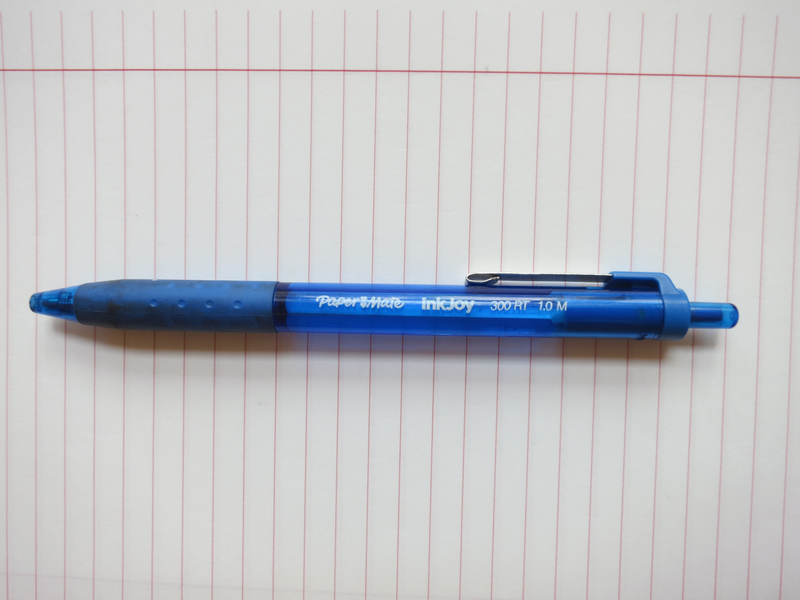 What is your favorite ballpoint pen?